Every single Sixers player, including ones who had played for the Blue Coats earlier in the day, scored and had an assist Tuesday night. The Shamwow was dripping wet Tuesday night. Landry was already off to a great game with four 3-pointers in the first half, but he reached a higher plane of existence when he hit four more triples across the final four minutes and change of the third quarter. Having hit eight already, Shamet found himself one shy of the NBA rookie record for 3-pointers in a game (9, held by Roddy Beaubois and Yogi Ferrell). After the game, Shamet said he had no idea what the record was or what he had, and his teammates were throwing random numbers at him. Despite those more attempts in the fourth quarter, Shamet was unable to tie the record, but an 8-for-14 night from behind the arc, and a rookie career-high 29 points, still makes for a memorable night. When your teammate is literally checking your temperature, you know you’re running hot. Before all the craziness broke out in the second half, this was Jimmy’s game. In his return from an upper respiratory infection (and first action since the Woj/Ramona ESPN report), Butler was extremely aggressive early on, tallying 11 points on 5-for-5 shooting, 2 assists, and 2 steals in the first quarter alone. Philadelphia’s first two buckets were both Ben Simmons buckets down low off assists from Jimmy; in fact, all three of Butler’s assists went to Simmons. #HeadbandBrothers. Butler finished 8-for-9 from the floor, taking good shots and making the extra pass on more than one occasion, played disruptive defense, and did everything possible to change the narrative after the recent bad press. With Butler handling the ball slightly more than usual, Simmons often found himself posting up, and did a nice job finishing in the half court, including nailing one pretty right-handed hook. He swarmed the Wizards on the defensive end, helping to Thanos-snap-disappear Otto Porter from the game, and absolutely shocking Chasson Randle with his wingspan on one intercepted pass. Simmons can euro step his way past basically anyone when they’re back-pedaling in transition. If I had one nit to pick, it would be that he missed a couple easy bunnies when it looked he tried to get too cute with the finish on the fast break, but overall, a great performance from the young star. It looked like Embiid was the odd man out in “Operation: Keep Jimmy Happy” in the early going, often relegated to spot-up duty with Simmons down low and Butler initiating the action from the wing. 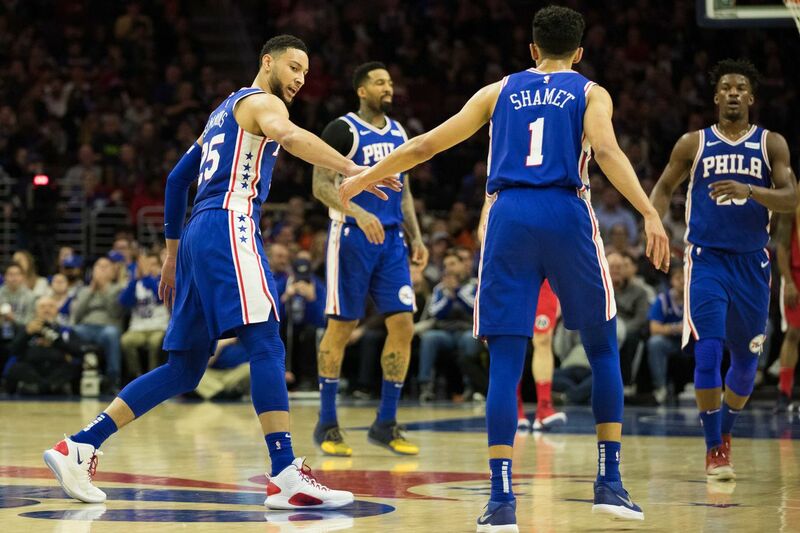 He made the best of it, though, hitting two of his four 3-point attempts, and had his chance to eat when he anchored units like the TJ-Furkan-Shake-Bolden group in the first quarter. Overall, it was a very casual effort from Embiid, who still finished with 20 & 10 because he’s a titan among mere mortals. Plus, he brought eternal joy to one young man’s life.